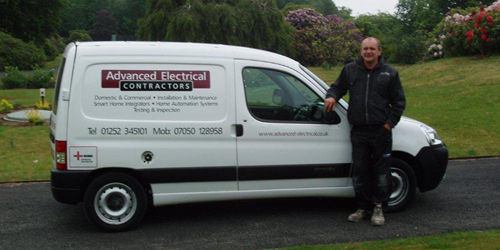 Advanced Electrical Contractors started trading in 1989 as a sole trader. Our business grew steadily over the years and as our clientele base increased, our business expanded and now employs a team of fully qualified electricians. In 2007, the business moved from a sole trader to a limited company. We are based on the Surrey and Hampshire border and cover all of the surrounding areas. We pride ourselves on providing a high quality professional service with which we have acquired an excellent reputation over the years. In 1995, we became a member of the NICEIC. As an NICEIC registered company, we are continually assessed to ensure that we are competent and capable of meeting the relevant technical and safety standards, codes of practice and rules of the Schemes with which we are registered to. The NICEIC look at samples of our work, our premises, documentation, equipment and the competence of our key supervisory staff. As an existing registered company with the NICEIC, Advanced Electrical Contractors are re-assessed on a regular basis to ensure our standards are high. The NICEIC has been assessing the technical competence of electricians for over 50 years. Their aim is to protect everyone who uses electricity from unsafe electrical installations anywhere. The NICEIC helps to protect householders from the dangers of unsafe electrical installations. Employing an NICEIC registered electrician is the best way to ensure a safe job. “VERY GOOD STANDARD OF WORK” – comment from our NICEIC 2010 inspection! We undertake all aspects of electrical work which includes residential, commercial, installation, maintenance, emergency lighting, testing and inspection, smart home technology and home automation systems. BS 7671 requirements for electrical installations. All our work is covered by Public Liability Insurance to the value of £5,000,000. For a free, no obligation quotation, click here to send us an email, or call us today on either of the phone numbers below.